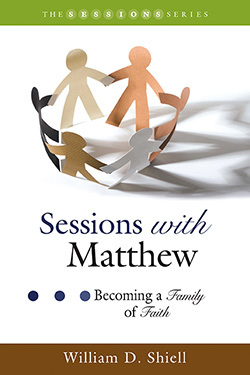 Sessions with Matthew is an eleven-session study unit designed to provide a compelling look at the Gospel of Matthew. Each session is followed by a thought-provoking page of questions that allow for a deeper experience of the scriptural passages. These resource pages can be used by seminar leaders during preparation and group discussion, as well as in individual Bible study. William Shiell takes readers on a journey through the Gospel of Matthew. Immersing us in the first-century world, this study will help us read the ancient biography of Jesus in light of the first listeners’ expectations and hopes and will draw analogies to the modern world. Sessions with Matthew also focuses on passages that make Matthew unique among the Gospels. Dr. William D. Shiell is the senior pastor of First Baptist Church of Knoxville, Tennessee. Bill is a graduate of Samford University (B.A. ), Baylor University’s Truett Seminary (M. Div. ), and Baylor University (Ph.D.) He is the author of Reading Acts: the Lector and the Early Christian Audience. He and his wife, Kelly, have two sons, Parker and Drake. What Happened after Jesus Was Born?